If you do a web search for “mortgage rates” you’ll likely see a list of interest rates from a variety of different banks and lenders. Unfortunately, this won’t tell you much without actually knowing why the rates are what they are and if they’re actually available to YOU. It’s really just a bunch of numbers on a page. Shouldn’t you know how lenders come up with them before you start shopping for a home loan and buying real estate? Many homeowners tend to just go along with whatever their bank or mortgage broker puts in front of them, often without researching mortgage lender rates or inquiring about how it all works. Whether you’re interested in rates or not, it’s wise to get a better understanding of how mortgage rates move and why. One of the most important aspects to successfully obtaining a mortgage is securing a low interest rate. After all, the lower the rate, the lower the mortgage payment each month. And if your loan term lasts for 360 months, you’re going to want a lower payment. If you don’t believe me, plug some rates into a mortgage calculator. – Are Mortgage Rates Going Up or Down? To put it in perspective, a change in rate of a mere .125% (eighth percent) or .25% (quarter percent) could mean thousands of dollars in savings or costs annually. And even more over the entire term of the loan. Mortgage rates are offered in eighths. One thing I’d like to point out first is that mortgage interest rates move in eighths. In other words, when you’re ultimately offered a rate, it will either be a whole number, such as 5%, or 5.125%, 5.25%, 5.375%, 5.5%, 5.625%, 5.75%, or 5.875%. The next stop after that is 6%, then the process repeats itself. When you see rates advertised that have a funky percentage, something like 4.86%, that’s the APR, which factors in some of the costs of obtaining the loan. Same goes for quintessential promo rates like 4.99% or 5.99%, which again factor in costs and are presented that way to entice you. Those popular surveys also use average rates, which don’t tend to fall on the nearest eighth of a percentage point. Again, these are averages, and not what you’d actually receive. Your actual mortgage rate will be a whole number, like 5% or 6%, or fractional, with some number of eighths involved. That’s just how mortgage interest rates operate. However, there are some lenders that may offer a promotional rate such as 4.99% instead of 5% because it sounds a lot better…doesn’t it? Either way, when using loan calculators be sure to input the correct rate to ensure accuracy. So, how are mortgage rates set? Although there are a variety of different factors that affect interest rates, the movement of the 10-year Treasury bond yield is said to be the best indicator to determine whether mortgage rates will rise or fall. But why? Though most mortgages are packaged as 30-year products, the average mortgage is paid off or refinanced within 10 years, so the 10-year bond is a great bellwether to gauge the direction of interest rates. Treasuries are also backed by the “full faith and credit” of the United States, making them the benchmark for many other bonds as well. Typically, when bond rates (also known as the bond yield) go up, interest rates go up as well. And vice versa. Don’t confuse this with bond prices, which have an inverse relationship with interest rates. Investors turn to bonds as a safe investment when the economic outlook is poor. 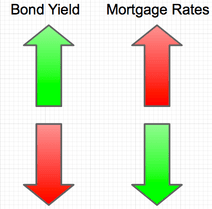 When purchases of bonds increase, the associated yield falls, and so do mortgage rates. But when the economy is expected to do well, investors jump into stocks, forcing bond prices lower and pushing the yield (and interest rates) higher. – 10-year bond yield up, mortgage rates up. – 10-year bond yield down, mortgage rates down. So a good way to predict which way mortgage rates are headed is to look at the 10-year bond yield. You can find it on finance websites alongside other stock tickers, or in the newspaper. If it’s moving higher, mortgage rates probably are too. If it’s dropping, mortgage rates may be improving as well. To get an idea of where 30-year fixed rates will be, use a spread of about 170 basis points, or 1.70% above the current 10-year bond yield. This spread accounts for the increased risk associated with a mortgage vs. a bond. So a 10-yr bond yield of 4.00% plus the 170 basis points would put mortgage rates around 5.70%. Of course, this spread can and will vary over time, and is really just a quick way to ballpark mortgage interest rates. There have been, and will be periods of time when mortgage rates rise faster than the bond yield, and vice versa. So just because the 10-year bond yield rises 20 basis points (0.20%) doesn’t mean mortgage rates will do the same. In fact, mortgage rates could rise 25 basis points, or just 10 bps, depending on other market factors. Economic activity impacts mortgage rates. Mortgage interest rates are very susceptible to economic activity, just like treasuries and other bonds. For this reason, jobs reports, Consumer Price Index, Gross Domestic Product, Home Sales, Consumer Confidence, and other data on the economic calendar can move mortgage rates significantly. As a rule of thumb, bad economic news brings with it lower mortgage rates, and good economic news forces rates higher. Remember, if things aren’t looking too hot, investors will sell stocks and turn to bonds, and that means lower yields and interest rates. If the stock market is rising, mortgage rates probably will be too, seeing that both climb on positive economic news. And don’t forget the Fed. When they release “Fed Minutes” or change the Federal Funds Rate, mortgage rates can swing up or down depending on what their report indicates about the economy. Generally, a growing economy (inflation) leads to higher mortgage rates and a slowing economy leads to lower mortgage rates. Inflation also greatly impacts home loan rates. If inflation fears are strong, interest rates will rise to curb the money supply, but in times when there is little risk of inflation, mortgage rates will most likely fall. What other factors move mortgage rates? Issues such as supply come to mind. If loan originations skyrocket in a given period of time, the supply of mortgage-backed securities (MBS) may rise beyond the associated demand, and prices will need to drop to become attractive to buyers. 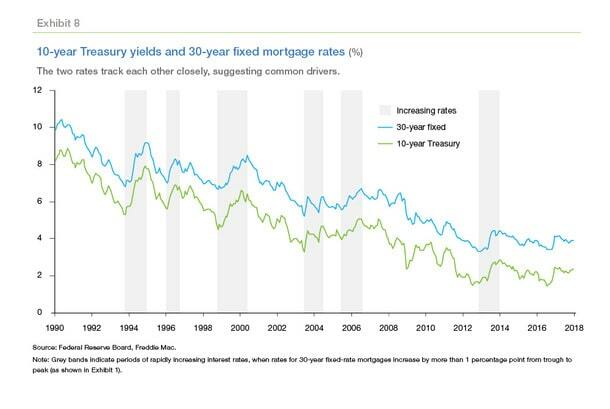 This means the yield will rise, thus pushing mortgage interest rates higher. In short, if MBS prices go up, mortgage rates should fall. If MBS prices go down, expect rates to move higher. But if there is a buyer, such as the Fed, who is scooping up all the mortgage-backed securities like crazy, the price will go up, and the yield will drop, thus pushing rates lower. This is why today’s mortgage rates are so low. Simply put, if lenders can sell their mortgages for more money, they can offer a lower interest rate. This explains why the Fed has purchased all those MBS. They can essentially guide mortgage rates lower, and ideally keep home prices stable, by enticing more would-be buyers into the market. Timing is an issue too. Though bond prices may plummet in the morning, and then rise by the afternoon, mortgage rates may remain unchanged. Sometimes the bond movement doesn’t make it down to the capital markets, or it simply takes more time to do so, thus rates are unaffected. Mortgage companies are typically cautious when it comes to offering a lower interest rate, but quick to raise them. Put another way, good news can take a while to move rates, whereas bad news can have an immediate impact. Go figure. The situation is a lot more complicated, so consider this is an introductory lesson on a very complex subject. Tip: Mortgage rates can rise very quickly, but are often lowered in a slow, calculated manner to protect mortgage lenders from rapid market shifts. Also note that the par rate you see advertised on TV and the web often don’t take into account any mortgage pricing adjustments or fees that could drive your actual interest up considerably. 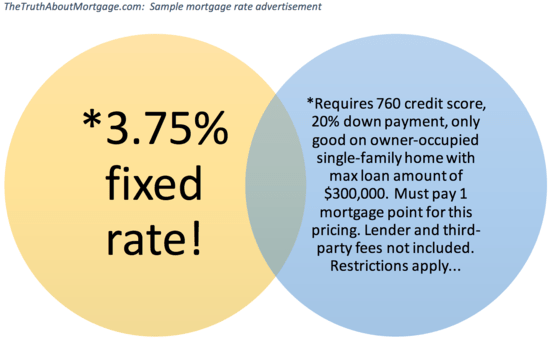 Generally, a lender will showcase a mortgage rate that requires perfect credit, a 20% down payment, and is only available on an owner-occupied single-family home, as seen in my fictitious mortgage rate ad illustration above. If your down payment or credit score isn’t that high, or your home equity is low, your mortgage rate may creep higher as well. Occupancy and property type will also drive rates higher, assuming it’s a second home, investment property, and/or a multi-unit property. So expect to pay more if that’s the case. If you do put less than 20% down, you’ll also have to factor in mortgage insurance, which if not explicitly charged, is usually built into the rate. There are also loan amount restrictions…pricing can change depending on if the home loan is conforming or jumbo. Typically, monthly payments are higher on the latter, all else being equal. In other words, YOU and your property matter as well. A lot! If you’re a risky borrower, at least in the eyes of prospective mortgage lenders, your mortgage rate may not be as low as what you see advertised. Things like a poor credit score and a small down payment could lead to a much higher mortgage rate, whereas borrowers with stellar credit and plenty of assets may get access to the lowest fixed rates available. At the borrower level, the biggest factor in determining the price of a mortgage is typically credit score. One of the most important factors that you can control is your credit score, so if you can at least get a handle on that and work to keep your scores above 760, your pricing should be optimal, all else being equal. Additionally, your mortgage rate can shift quite a bit depending on if you pay mortgage points or not, and how many points you wind up paying. There are loan calculators that will tell if paying points make sense depending on your situation, how long you plan to stay in the home, and so on. Rates can also vary substantially based on how much a certain lender charges to originate your loan. So the final rate can be manipulated by both you and your lender, regardless of what the going rate happens to be. For example, the well-known mortgage companies that advertise on TV might be more expensive than the no-name brand, but at the end of the day the product might be exactly the same. Lastly, note that there are a variety of different loan programs available with different interest rates. Are we talking about a 30-year fixed rate or an adjustable-rate mortgage, the latter of which will have a lower interest rate. Loan type and loan amounts can play a big role here. Below are Freddie Mac’s average mortgage rates, updated weekly every Thursday morning. This should give you a decent idea of current mortgage rates, though as mentioned, they’re just averages and your rate may vary considerably depending on the many factors mentioned above. 1-Year ARM: no longer tracked as of 2016. Since 1971, Freddie Mac has conducted a weekly survey of mortgage rates. These are average home loan rates gathered from banks and lenders throughout the nation for conventional, conforming mortgages with an LTV ratio of 80 percent (20% home equity or down payment). These averages don’t apply to government home loans like VA loans or an FHA mortgage. The numbers are based on quotes offered to “prime” borrowers, those with high credit scores, meaning best-case pricing for the most part. I believe the property type in the survey is for a one-unit primary residence as well, so expect a rate rise if it’s a vacation home or rental property, or multi-unit property. Freddie uses HMDA data to establish regional weightings in five regions of the country, then aggregates that market data to compute a national average for their weekly rate update. In other words, your mortgage rate may deviate from the national average for any number of reasons, but if your home loan is pretty run of the mill, you might expect pricing to be similar. As you can see, 30-year fixed mortgage rates are the most expensive relative to the 15-year fixed and select adjustable-rate mortgages. This is the case because the 30-year fixed rate never changes, and it’s offered for a full three decades. So you pay a premium for the stability and lack of risk, and the opportunity to refinance if rates happen to go down. Rates on the 15-year fixed are significantly cheaper, but you get half the time to pay it off, meaning larger monthly payments and a lot less interest paid. When it comes to 20-year mortgage rates, you might be looking at something in between the 30-year and 15-year, such as a quarter percent (0.25%) below the 30-year fixed. The shorter term means you’ll also save a ton on interest. Rates on ARMs are discounted at the outset because you only get a limited fixed period before they become adjustable, at which point they generally rise. Grab a mortgage calculator and price out different loan types to see what makes the most sense for your situation. You can use these average rates as a starting point when determining what rate you might be offered. If your particular loan scenario is higher risk, whether it’s a higher LTV and/or a lower credit score, it will probably be priced higher. If you’re looking for current mortgage interest rates, you can take a gander at these weekly averages to see both the direction of rates and the ballpark figures to at least get an estimate of what you might receive at any given time. Tip: What mortgage rate can I get with my credit score? In late 2012 and early 2013, fixed mortgage rates hit all-time record lows. The 30-year fixed, as tracked by Freddie Mac, hit its lowest point ever during the week ended November 21, 2012, falling to 3.31%. Since then, it has risen fairly steadily. The 15-year fixed hit a record low 2.56% during the week ended May 2, 2013, the lowest point since tracking began in 1991. It too has risen since hitting its low point. During the same week, the 5/1 ARM also hit its all-time record low of 2.56%, though records only date back to 2005. Finally, the one-year ARM fell to 2.41% during the week ended April 10, 2014, its lowest point on record since 1984. Most economists don’t see rates falling back to these lows again, though anything is possible if the economy warrants such a move. Wondering if mortgage rates are going up or down in 2019 and the year after? Wonder no longer. The following table provides 2019 mortgage rate predictions for the 30-year fixed from well-known groups in the industry, along with a 2020 estimate. Take them with a grain of salt because they’re not necessarily accurate, just forecasts for future movement. As you can see, mortgage rates are mostly projected to go up in 2019, though not by a whole lot. So if you’re in the market to buy real estate, conditions might be favorable in terms of financing. Of course, it will vary depending on which forecast you believe. Rates are expected to stay in the 4-5% realm in 2019, which should be welcome news to most. I have just released the 2019 mortgage rate forecast for those looking for a more detailed assessment. Not sure what classes you’re referring to, but if rates are high, that’s probably a sign the economy is doing well, which could lead to home price gains. Can anyone tell me how a bank determines one’s mortgage rate when the advertised rates are a range, e.g. 3.75%-4.125%? Its called the monthly payment. When Interest rates are low, people can afford a larger monthly payment; this artificially pushes home prices up. When Interest rates are high, people can afford a smaller monthly payment; home prices will have to come down because of this. As the article states, there are a ton of mortgage pricing adjustments that can greatly alter your rate, such as your credit score, your LTV, your loan amount, your property type, the transaction type (purchase vs cash out refi), loan type, lock period, etc., etc. Great Article! Very informative and I’ve learned a bunch. Just one question that I need to explain to the Hubs…. 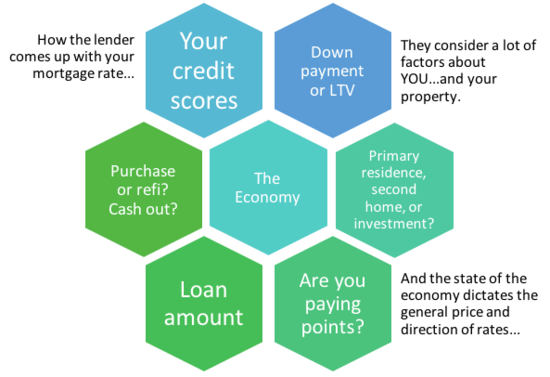 How exactly is a credit score calculated for a Mortgage? Hub’s upset mine came back higher, even though Credit Karma is showing him as about 10 points above mine? The scores you see on CK may differ from those a mortgage lender will pull, but won’t be based on income or area. I wouldn’t get upset, as long as you both have good scores it shouldn’t matter who is higher (other than pride). Haven’t heard of that…could be two different loan products such as FHA and conventional programs with different rates. How come some rates are higher than others on the same day? And how come some loan officers charge so much more on your loan than the going rate…is it allowed? Can my loan officer hike up my interest rates and blame it on my credit I have a 685 credit score. It’s a free market like anything else – lenders are able to charge whatever they feel is reasonable (to an extent) so rates at one bank may be higher than another if they feel they can still sell it to the customer using their brand or customer service as a selling point. A 685 score isn’t terrible, but it is low enough to cause the interest rate to rise so it’s best to get your score above 740 to avoid any price increases. Hey bud, long time no talk to. I’m an LO now (officially tomorrow after taking the NMLS exam), and am using your website as a resource! I also referred your blog to our in-house trainer. Thanks for the note and the referral. 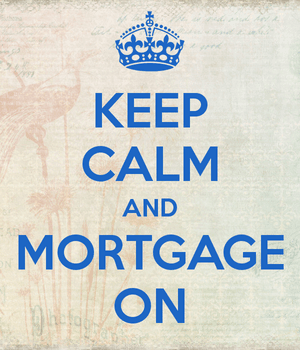 Good luck and here’s to hoping your loan pipeline is always full! This was a great article thank you! Do you have any other posts that go more in depth to how lenders determine their spreads over the baseline rates, how they price them out and sell to secondary, and how lenders determine their minimum spreads to make their target profits? (Doing a senior finance major project on how rate pricing with mortgages works.) Any help would be greatly appreciated thank you! That’s pretty much it because this is a consumer-oriented post. Good luck in your research. It can be, especially if you don’t keep the mortgage long. Higher interest rate could be one way to say it, but I’d just say higher cost of doing the loan. it is true that a loan may be priced worse at 80 LTV than 85 due to PMI. Lender faces higher risk at 80 LTV with no MI vs. 85 LTV and MI. Interesting point, and often MI is baked into the loan, which in turn equates to a higher rate.